From medieval to early modern times, the value of a coin was based on its precious metal content – usually silver. With Ireland split into numerous petty kingdoms, the local ruler would have his own mint with a local moneyer to produce coinage. If a moneyer used less precious metal than was required so that the product was under weight or if they used a more debased metal that was below the required fineness, then the coinage produced would be devalued in relation to other coinages. To protect English coinage from being devalued due to unscrupulous minters, the minting of gold and silver coins was reserved as a royal privilege. In Ireland, however, unscrupulous English kings deliberately debased to local currency in order to limit economic activity and prevent any economic independence. Due to inflation, variations in the value of silver and debasement of the silver content in lower denomination coins, it was decided to make coins from base metals such as copper. If these were to have an intrinsic value equal to their face value, they would have been too costly to produce. Alternatively, it was decided that small change coins could be made of base metal but in a somewhat smaller and usable size, that was economic to produce. This would mean their intrinsic value would be less than their face value, so they would have only a token status. As tokens, their use at face value would be dependent on local acceptance. The resolution of this problem was, those people who needed small change the most, namely the local merchants, produced small change token pieces and used them in their daily commerce. The public knew the tokens would be accepted by the local merchants who were issuing them, so they had confidence in accepting and using the tokens at face value to make local purchases. These privately produced token coins were made of lead, tin and even leather. 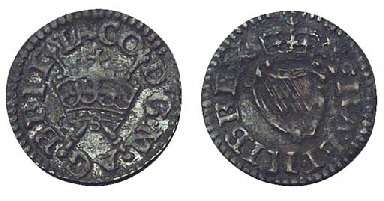 A large number of such pieces were in circulation through the reign of Elizabeth I throughout Ireland, England, Scotland and Wales..
By the time James I came to the throne, even these tokens were to be issued under license and, on 19th May 1613, James issued a proclamation prohibiting private token coinage. Since producing base metal coins was considered beneath him, James granted John Harrington, Lord of Exton, a royal patent to produce copper farthing tokens which were to be used throughout the realm. As expected, Lord Harrington and the king hoped to share sizable profits from this enterprise. The coins were authorized to be just six grains but the first products actually weighed only five grains. Due to the protests over the minute size of these tokens the weight was later increased to nine grains. These copper coins, which displayed a crown and crossed sceptres on the obverse with a crowned harp on the reverse, were extremely small and easily counterfeited. Of the three Harrington varieties two were very small (12.25mm) and were plated with tin, the third variety was larger (15mm) and issued in copper without plating. When Lord Harrington died in 1614, this valuable (and highly profitable) patent passed to several relatives who, in turn, began issuing farthings and the public regularly protested that the patentees (Lennox) were profiteers producing extraordinarily lightweight coins that were frequently counterfeited. The last patent holder (Maltravers) even refused to accept tokens of earlier patentees, stating too many counterfeits were in circulation. This caused great economic hardship on the poor who held the tokens. In 1642, when the Puritans took control of the Parliament, the coining monopoly was abolished and the minting of the patent farthings ceased. In 1648, following several months of civil war in England, King Charles I was captured, tried and executed. A Commonwealth was then established with the Puritan military commander Oliver Cromwell as Lord Protector. Many of the former patent farthings were used in the colonies of New England but even there, they were eventually banned. Around this time, England returned to the use of small change trade tokens – and Ireland followed. Numerous merchants and municipalities issued farthing and halfpence tokens as well as some penny tokens made of copper, lead and sometimes tin. Although most examples were round some were octagonal while others were square and a few were even heart shaped. These tokens were local hammer-struck coins of a much larger size than the patent farthings. With many towns in every county producing them, these traders’ tokens formed an illegal currency also known as “money of necessity” and economic activity could resume at a micro level once more. 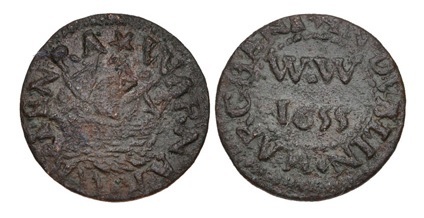 In Ireland, trade tokens appear in 1653 and continue until 1679, when they were replaced by regal halfpennies in 1680. Over 800 different issues, from 179 localities, are known from Ireland at present. Most Irish tokens, unlike the English, give their denomination as a penny. A further contrast from their English counterparts is a lack of a precise statement of trade. In Ireland a bland ‘Marchant’ (sic) is often the only information, sometimes supplemented by a trade company’s arms. Research on some southern issuers indicates that many were speculators and capitalists, rather than shopkeepers or simple traders. Given the difficulty of raising capital outside the main financial centres in the mid-17th C, the ability to put several pound’s worth of tokens (produced at a fraction of their face value) into circulation and keep them there for several years, must have been a considerable financial advantage – without the trouble of banking governance, fluctuating interest payments and regular loan repayment. 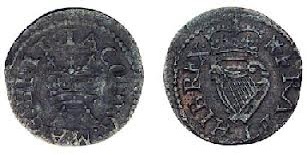 The restored monarchy under Charles II halted this numismatic revolution in 1672 when they banned these early trade tokens but the last Irish tokens of this type were not issued until 1679. By this time, over 20,000 different tokens had been minted throughout Ireland, England, Scotland Wales. They were replaced by standardised copper farthings and halfpennies issued by the Royal Mint for circulation. ← Piedfort Coins – Twice the weight, double the thickness ! An excellent introductory post. It would be great to have a few more posts on this topic which focus on a few selected tokens from the extensive series C17th tokens from Ireland. The general belief is that C17th tokens in the British Isles had only a very local circulation to their issuer’s home street or town. Metal detector finds distributions of such tokens in the UK is providing some new evidence to challenge this previously long held assumption. What is the evidence like on this subject for similar tokens issued in Ireland? Also do examples of main land C17rh tokens ever turn up in Ireland to indicate a cross sea exchange in small change with travelling traders? Certainly C17th token issues from Dublin made there way in large numbers to the Isle of Man but I not sure if they also found there way further a field? I try to keep an eye on the PAS database for Irish coin finds in Britain and there certainly is some 17th C tokens being found. How they got there is another question – one I have insufficient data to even attempt an answer. British and European coins, tokens, jetons and checks proliferated in 17th C Ireland for a number of reasons. I have just published an article on the token of Henry Bollardt, Apothecary (Dublin 1654). Its not as polished as some of your articles but I hope this meets with your approval. An interesting piece of history neatly illustrated by local coinages. Do you have a full list of coin tokns issued in each town or county in Ireland during this turbulent period. The Great Rebellion of 1641, the Cromwellian Invasion and the run up to the Williamite Wars is such a complex period to study.